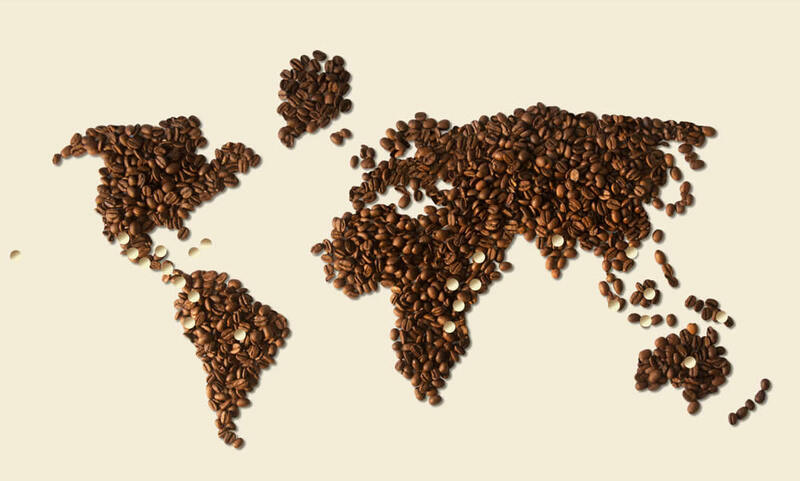 From bean to brew; we can trace our coffees from the grower until it reaches us here in Dundee. We only work with suppliers we trust, prioritising quality at all times, with only the best being good enough. Our green coffees are ethically sourced from over 24 countries and combined with our roasting and blending heritage and expertise, we ensure only the highest quality private label coffee is packed and delivered to our customers. We offer a complete range of sustainable marks including Fairtrade, Rainforest Alliance and UZT. Freeze dried and granulated instant coffee is also available and both can be supplied as catering or vending products. Should you wish to discuss your private label requirements with us please get in touch. Arabica beans are grown in Brazil at elevations between 2000 and 4000 feet producing coffee with smooth and mild flavours, often nutty and sweet, with little acidity producing a rich espresso. Colombia is one of the world's largest producers of coffee and is unique in its ability to harvest coffee all year long. Colombia's coffee grows in the moist, temperate foothills of the Andes, where the combination of high altitude and moist climate produces a dense bean, making for an especially mild cup. Peru's climate is highly diverse, ranging from the tropical east to the dry western desert. The rich soil and equatorial climate help produce coffee with a bold, full bodied flavour, bright acidity and a smooth aroma. Peru accounts for only 2% of the world's coffee production but is quickly building a reputation for producing high quality Arabica beans. Coffee has played in the country’s development since coffee trees were first cultivated there in the late 1790s. All beans grown in Costa Rica are Arabica and the coffee is characterised by its symmetry and balance with taste notes of citrus, berries, and smooth roasted chocolate. At high altitudes and in mineral-rich volcanic soils, coffee grown in El Salvador has exceptional balance and sweetness and matures more slowly producing a harder, denser bean. The resulting taste is one with a hint of spice with a hazelnut finish. The micro climates above 700 metres that product Guatemalan hard bean coffee enjoy ideal rainfall patterns and superbly rich soils resulting in a perfect balanced, delicate high altitude cup. With distinct fruit flavours and a delicate sweetness it's coffee has a full body and a clean finish that pleasantly lingers. Depending on growing region and altitude, the finest Honduran coffees can range from bright, acidic flavor profiles, lightly fruited and with strong cane sugar sweetness, to more caramel-like, lower acidity coffees that are nice in espresso. Typical of Central American beans, very fine specialty coffee is produced in the mountains of Nicaragua. The highest quality Nicaragua coffees have rich flavor, mild fruity brightness, and full body. Mexico produces light-bodied, nutty beans perfect for dark roasts and blends. The high grown Mexican beans use the mountain water process method to produce a clean, crisp coffee that gives a mildly intense sweet coffee, clean and bright with medium body. With its natural climate and geography, Cuba has the potential to produce some of the world’s best beans. Most of the coffee beans grown in Cuba are of the Arabica bean variety and are known for their full body and rich fragrance with smoky notes which gives an extremely smooth cup. The unique Kona Coffee Belt growing region is located on the fertile volcanic slopes on the island of Hawaii at elevations from about 2000 to 3000 feet above sea level. Kona coffee beans provide a delicate and light cup of coffee, very well-balanced and with a distinct complexity in both its taste and aroma. Australia is a very new region to growing coffee, and has many unique problems compared to traditional growing origins. The beans produce a very smooth, balanced coffee with rich flavor, a full body and great buttery tones. There are some similarities between Australian coffee and the Jamaican Blue Mountain beans. Most of the coffee produced in Uganda is Robusta, and is used for instant coffee. Uganda does produce one fine Arabica and it is grown on the western slopes of Mt. Elton on the Kenyan border. This coffee is mildly acidic and similar to Kenyan coffee in flavour, though lighter in body. Kenya has a reputation for exporting high quality coffee beans. Most coffees in Kenya are cultivated on very small farms, and the growers are rewarded with high prices for high quality beans, known for having tremendous body, astounding winey acidity and blackcurrant flavour and aroma. The Tanzania coffee character belongs to the Central/East African family of washed (wet-processed) coffees- bright acidic, and almost aggressively flavourful, the coffee can produce a uniquely sharp and exciting cup. The birthplace of coffee and with a history going back to the 10th century, Ethiopia produces some of the most unique and fascinating coffees in the world. Yirgacheffe beans in particular are carefully picked for their intensity and clarity of flavour making a coffee with a distinct floral aroma. Known for its full body and smooth, well-rounded taste, Malawi coffee has a unique flavor profile that distinguishes it from its African neighbors. There’s been a rapidly growing demand for beans from this region over the past decade, which give a light floral aroma with flavors of chocolate and berries. Sumatran coffees are renowned for their low acidity, thick body, and rustic flavours that can often be described as earthy. Grown between 3000 and 5000 feet above sea level, Sumatran beans are predominantly wet-hulled giving a spicy yet full bodied flavour. Smallholder farms situated on the old colonial estates of Java employ traditional processing techniques to produce unique coffee. Before roasting, the beans are "monsoon"; exposed to the region's moist, warm air during the rainy season for up to three years to develop their strength of taste and weaken their acidity. Indonesia is most notable as the world's largest producer of robusta beans. Hot, tropical climate conditions, high altitudes and fertile soil all contribute to the full bodied and mellow spiciness of coffee beans from Indonesia. The darker the beans are roasted, the smokier the aroma is. Vietnamese coffee dates back to 19th century IndoChina and Vietnam is now the second largest exporter of coffee in the world. Fragrant and chocolatey, Robusta beans are the world's most common and popular species grown throughout the lush Annam Highlands. Papa New Guinea coffee us cultivated on small plantations in the mountain highlands, and is processed using the wet method. The coffee is typically well-balanced with a fruity aroma and earthy body, and generally has less acidity, aroma and body than other fine Indonesian coffees. According to legend, India is the birthplace of coffee cultivation east of Arabia. These coffees are known for their unique spicy flavours of nutmeg, clove, cardamon and pepper. India also produces monsoon coffees, a process that reduces acidity and enhances sweetness. The majority of Jamaica’s coffee is grown in the Blue Mountains. The beans produce a smooth & rounded brew with beautiful complexity and a highly aromatic finish. A balance of mild, sweet floral flavours with hints of tropical berries and a mild nuttiness create an excellent cup. Our expert blenders will work with you to create your desired taste profile. We offer single origin coffees through to crafted blends and we can guarantee to match any existing blend required. We like to educate our customers on their coffee and we will guide you through the taste and aromas unique to your blend. All our coffee is roasted onsite by our experienced roasters ensuring every batch meets our exceptionally high standards. Our coffee is roasted at a variety of temperatures depending on the taste desired and we use our advanced colour meter to ensure consistency at all times. From catering to vending, at James Aimer we understand every customers needs are different. We can offer a range of whole bean and ground options to suit your requirements. Whether your coffee is packaged in your own bespoke packaging or in one of our generic options, every bag packed at James Aimer goes through our rigorous quality checking process, ensuring the highest quality of coffee every time. We pride ourselves on our reliable on time delivery service. We will never make a promise we cannot fulfill, giving our customers peace of mind and confidence their coffee will arrive when it is needed. Our aim is simple. To provide you with a product you are proud to put your name to.